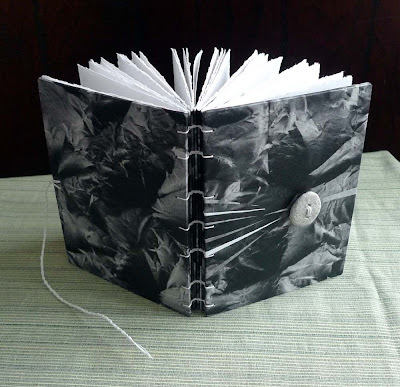 The next swap book to unveil, is from Kristi of OliveArt.Etsy.com. Kristi says, "the covers, end sheets, and signature covers are made from beautiful Indigo Thai paper. This particular paper has an abstract all-over pattern, to me it looks like crumpled up paper with a strong light source (that's the art teacher talking), but others see dark sandy, and storm clouds. 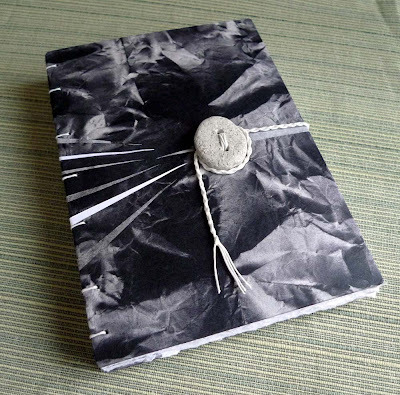 White and patterned points lead the eye over the cover to the beach stone button that along with a round braid of white waxed linen thread helps fasten the book. The white thread is also used on the coptic-stitched binding." Visit OliveArt.Etsy.com to see more of her work. Fabby! I love this Thai paper. It does look like crumpled paper - I thought you had made it yourself! The pebble with braided tie is really lovely. The recipient of this book will feel very lucky! So pretty! That Thai paper is just lovely, as is the beach rock! As a California coast girl, I think that's a particularly lovely touch. I like the gray tones in this one.I don't think I have seen such a stone button before. I think it completes the design in just the right way. - Very beautiful book! How does it feel to the touch? Is the covering paper smooth, and the pattern printed on it? Or is it at least a bit crumpled? This was the book I received. Not only do I love it, but many friends have picked it up off my table and admired it. Thanks OliveArt! P.S. I love your stickers too. I might have to steal that idea. The thai paper is really smooth and feels nice in your hands! Cool book! I love the depth that the paper lends.